I cannot, in good conscience, recommend couples therapy when there is such a thing as canoeing. No workshop, emotional guru or self-help bestseller can teach two people to communicate faster or more effectively. Or die trying. Upon launching our canoe it seemed, briefly, that this two-and-a-half hour trip might take four. As we careened from bank to bank, shredding delicately beautiful spider webs – whose gifted and occasionally hairy architects often landed in my lap – we sent every red-bellied turtle we encountered, warm and happy on their smooth cypress logs, to the bottom of the chilly stream. We were a floating wrecking ball amid Mother Nature’s Hummel collection. Fortunately, our paddling improved significantly by the time we reached Flint Creek, which was the embarkation point of our trip in earnest. We had all the incentive we needed to improve as canoeists and communicate as a couple. By the time we’d paddled the length of the creek to reach its confluence with the Hillsborough River, we were sufficiently relaxed to check things out. Faulk was dead-on; it was alligator Club Med. Living dinosaurs, some six or seven feet long, basked just a few feet from our boat, unmoving and wholly uninterested in us. Gators here might be used to the paddlers, but they are also used to being left mercifully alone (get too close and they’ll simply slip away in search of solace). Above all else, this outfitter teaches respect for the river and all things in and around it; Canoe Escape has been at it since 1991. This is not the vendor for the beer-addled float trip. Not even radios are permitted. And no sensible paddler would want one lest he miss the eerie call of the limpkin; the chatter of herons, egrets and ibises; the creaking of centuries-old cypress trunks; or the fluid sound of a river otter sliding into the water after a long cool drink at the edge of this tributary (a sight we were rewarded with for our stealth). 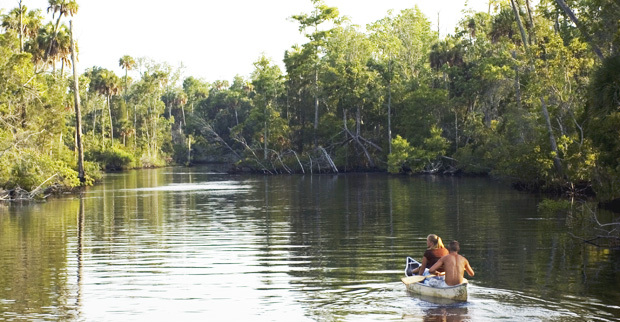 Unbelievably, this glorious tract of natural Florida lies not hours, but roughly 30 minutes from downtown Tampa and Canoe Escape offers an array of trip options, with or without an interpretive guide. Faulk was on the river that day with a couple from the U.K. – the Clays – and their 11-year-old son, James. “I would do trips like this over a theme park anytime,” said the mother, Caroline. “We all have a nice time, and he’s really learning.” Listening to James list the various nicknames of the black-crowned night heron on the ride back was proof enough that he’d been paying attention. “I didn’t even know this was here,” said father Stephen, who had visited Florida numerous times on vacation. This was his first trip to the Tampa region. Indeed, not many area residents are even aware that such unspoiled terrain shoulders up to their familiar suburban sprawl. This was a logging area for cypress many moons back, and remnants of the industry – formidable stumps, an old logging trestle – pepper the route. Canopied by magnificent live oak and cypress trees, this stretch of the river is “Land of the Lost” minus the tyrannosaurs. So rapt were we with the scenery and serenity that it wasn’t until hours later that I realized this had truly been a first: A canoe trip without one “Deliverance” reference. “Rocks, no salt, please,” I said, navigating a tortilla chip – still warm from the fryer – through a small trough of salsa. What the heck, I had earned a little refreshment after the morning’s adventure, and several people in and out of San Antonio, Florida (or “San Ann,” as the locals call it), had praised the fare at Pancho’s Villa. If you’re going to roll the dice on Mexican food from an as-yet-unproven kitchen, it may as well sound like a kitchen in Texas. Paddling can work up an appetite for many things: a good stretch of the legs; a comfortable place to push the rewind button and share tales of the river, even, perhaps, some tamales and a margarita. We chose from the combo menu, creating our own platters filled with generous portions of rice and astronomical heaps of tasty refried beans. The atmosphere in Pancho’s is not unlike that of its location in San Ann’s “downtown” – colorful and exceedingly laid-back. Of course, even when you’re stuffed sometimes you need a little sweet, so we picked up some locally made fudge next door at the San Ann Market. Surprisingly upscale with a variety of specialty foods, sans the haughtiness that often comes with them, the deli was lively with folks lining up for sandwiches and hot selections at the counter while they perused the ample wine inventory. Tables were available inside and in a charming courtyard out back. So, with bellies full of beans and fudge on our fingers, we headed back to the road for more small-town intrigue. One might think that Pasco County, with its abundance of cattle ranches and horse farms, would not be a particularly appealing place to drive with the windows down. Come orange blossom season, however, windows just get in the way. Soar, sunroof open or top down if possible – a comfortable tour-level Harley would be heaven – around the voluptuous dips and curves of roads like Morris Bridge, Scharber, Handcart or the aptly named Happy Hill and let it wash over you. Orange: the color, the fruit, the intoxicating perfume of our state’s chief agricultural export. Tool down some of the side roads – commonly unpaved – and regard astonishing ranch houses you might never expect to find in these parts. Roadside stands and markets are prevalent, offering loads of fresh citrus and other produce, locally made honey, jams and related confections. Pick something for your fridge, or for those poor souls up north, but be prepared to stop several times along the route if for no other reason than to test the orange-to-oxygen ratio both in and out of doors. For years, I lived under the assumption that Florida was as flat as the pre-Galileo Earth. This lovely section of Pasco, save the orange groves, seems more mid-Atlantic – even Northeastern – than subtropical, with its rolling landscape and hilltop views, evoking tender memories of home with no need for gloves or an ice scraper. From San Ann, we meandered north on Curley, then east on St. Joe, which took us almost directly into quaint and bustling (compared to San Ann, anyway) downtown Dade City. Combine its abundance of antique dealers, quilting shops, tea houses and B&Bs with its oak-lined streets and you’ve already got the makings of an enchanting town straight out of the Old South. Throw in Dade City’s centerpiece, the former Pasco County Courthouse – built in 1909 – and the cake has icing. And what goes better with cake than an authentic Cuban café con leche from the Tropical Breeze Café & Ice Cream Parlor? There is more sophistication to Dade City than meets the eye. In fact, if Mexican food at Pancho’s Villa doesn’t ring your bell, head directly to Dade City’s Lunch on Limoges. If the chalkboard menus don’t entice you, the fried green tomatoes, crab cakes and pecan chicken might. This longtime area favorite site inside what amounts to an eclectic boutique showcasing clothing, stationery and more.